Hello Dreamer!! 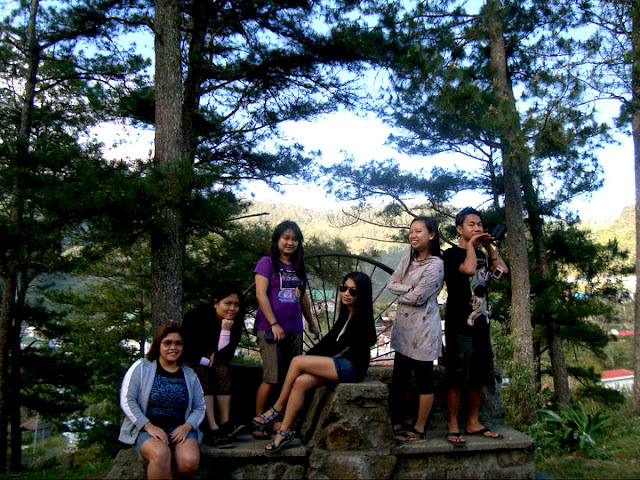 : My All Sagada Kwentos, Yebah! My All Sagada Kwentos, Yebah! Okay, so that's it. All my Sagada kwentos + Baguio side trip took me at least five entries. Plus this one, the all Sagada post. Yebah! I promised that I will divulge our expenses and itinerary. Let's start with our expenses. I know, we opted the easy way. Hehe. Pero masakit sa bulsa. We needed to pay for the driver's food and accomodation as well. So, P3733.33 plus food + driver's food + pasalubong! Not bad for a Sagada + Baguio trip. But we were not able to stick with our target P5000 budget! 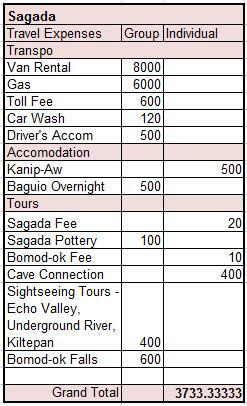 If you do want to reach Sagada via public transport. You could visit this blog. For the complete standard rate guide, check this out. Next is our itinerary, I just estimated the time spent on each activity. 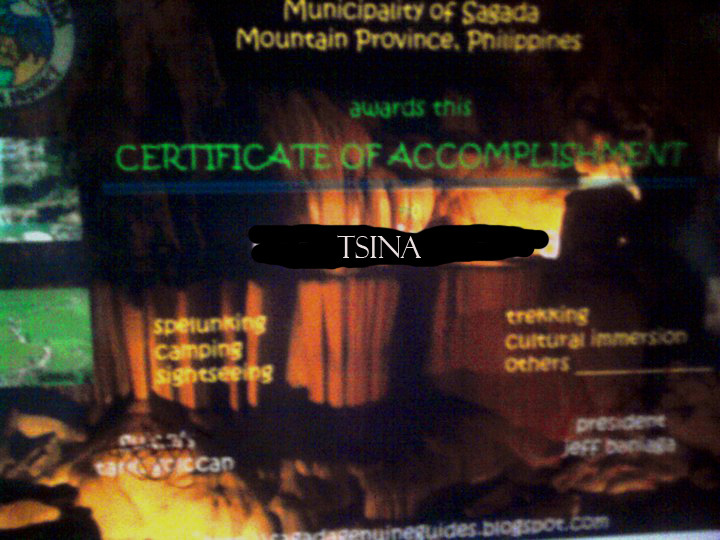 And if you want to go over my kwentos on our Sagada trip, feel free. For our first day, here's the link, we got lost most of the time. HAHA. Next is our second day, the uber tiring second day! Imagine trekking for hours in the morning and cave connection in the afternoon! Kami na!! HAHA! Then, of course, we couldn't miss the Bomod-ok Falls. Trekking again!! Day 3: Bomod-ok, All the Way! And ooohhh, don't forget your certificate of accomplishment. We did forget it. Good thing, my friend Cathy went to Sagada on the second week of March. She was able to get our prepaid certificates. Tip: Tell your guide that you would like to get the certificates in advance. Of course, my 26 before 26 goals is one goal shorter! Love it. nice... good for you.. at wala na ako masabi... heheh gusto ko din i try kapag nagkaroon ng opportunity!!! One down 25 to go! hi! 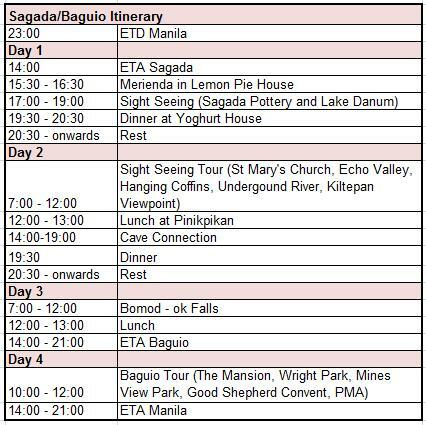 it’ll be my first time to go to sagada if ever this trip would push through. my friend and i are planning to go to sagada this holyweek. can you help me plan this trip, what places to visit and how much money would i be needing for my entire stay of 3days/2nights (including the tour). thank you so much! @ Glentot Skip reading much? Asar. kala ko may kung anong dumi sa screen ko. hehe. nice!. paborito ko pumunta diyan. pero bus ride lang. Indeed, there is an effort of every traveller to travel within his budget.